Even back in January when Microsoft agreed to pay $1.2 billion for enterprise search company Fast Search & Transfer, it was mired in an accounting scandal and trading in its stock had been suspended. Its aggressive accounting for phantom deals that never materialized earned it the moniker the “Enron of Norway.” But more sordid details keep coming out from some tenacious reporting by the Norwegian press. The latest account comes in the June 28 issue of the Norwegian magazine Dagens Næringsliv. In an article (in Norwegian) by Trond Sundnes, Dagens Næringsliv, Gøran Skaalmo, the magazine details how the Norwegian company booked free software trials as revenues, and how its executives set up shell corporations for allegedly self-dealing purposes. A translated version of the article (embedded below) is making the rounds among Fast’s competitors and inside Microsoft itself. The problems at Fast were financial in nature and tied to an overly aggressive sales culture, which arguably Microsoft can fix. But it does point to a certain blindness on the part of Microsoft, or at least a willingness to look the other way, in its obsessive quest to become a player in search (see Yahoo and Powerset). It also raises questions about Fast’s underlying search technology. If Fast was having trouble closing deals for its products, how good can its technology really be? According to the article, Fast had booked $50 million in fake revenue, $20 million in fictional contracts, and former top executives closely linked to CEO Markus Lervik siphoned off $6 million to shell companies they controlled. Lervik continues to lead the business and is currently the vice president for enterprise search at Microsoft. —The company had an aggressive practice of giving enterprise customers free trial periods and marking them down as tentative deals. —One of these was a large $18 million deal with Australian Telecom company Telstra that the company recognized as revenues in late 2006. But the deal then failed to materialize. —A second deal for which Fast never got paid was with Accoona, another shady search company. —An audit uncovered unauthorized payments to a shell company in Fort Myers, Florida called Archtech that is owned by a former Fast VP, Peter Bauert and Fasts’s former CFO Ali Riaz (through yet another company he controls called Bluebird Collabo). 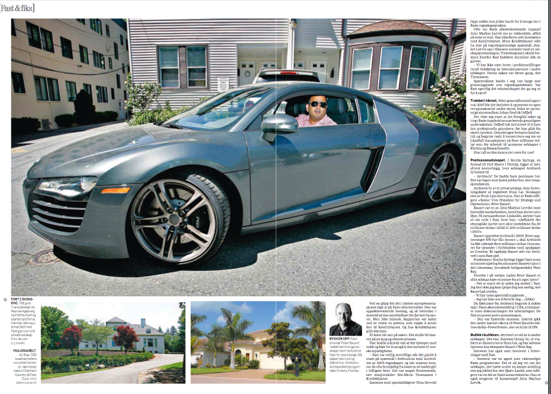 That’s Riaz in the Audi pictured above.
. . . companies owned or controlled by persons who at the time of the transactions were closely related parties. That is an apparent reference to Archtech and other shell companies that were supposedly reselling Fast software. The problem, according to the the documents Microsoft provided, was that these related companies “purchased” $3.5 million worth of software licenses for which Fast was never actually paid. I always wondered what the “transfer” part of Fast Search & Transfer referred to.